Shirts With Random Triangles: If the SEC were Doctor Who alien races. First some explanation, yesterday I read about a rumor over at Bleeding Cool about the possibility of some long-lost episodes of the original Doctor Who series might have been recovered. As an old school Doctor Who fan, these rumors have come and gone, usually without merit. If Rich Johnson hadn't written the piece, I wouldn't give it a grain of salt myself. Stillo, I'm hopeful something does show up from the show's long-past Sixites roots. Of course, it did give me a chance to ponder what classic Doctor Who monsters match up the best with the SEC's monsters of the gridiron. I'm not doing all SEC teams, just the ones that seem to fit The Doctor's most notorious enemies. Too obvious, but would you really want any other college football team to be the the most evil race of genetically modified space aliens the universe has ever known? Besides, "Roll Tide!" is the Southern equivalent of the Daleks' "EXTERMINATE! EXTERMINATE! EXTERMINATE! EXTERMINATE!" battle cry. 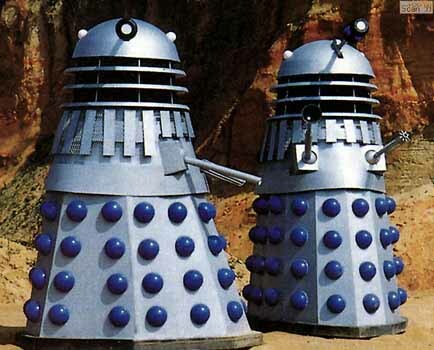 In many ways they're the Daleks' equals and opposites. Both alien races have organic forms encased in metallic bodies, only the Cybermen more resemble their former humanoid forms than do the Dalek's tank-like casings. A natural fit for Auburn. Okay, The Master isn't quite a monster (unless you count the version that appeared in "The Deadly Assassin"), but for our purposes he'll count as one. Especially as the chance to compare The Doctor's rival Timelord to South Carolina head football coach Steve Spurrier just can't be passed by. The Master's evil plans have given The Doctor fits for over forty years his various regenerations (none quite surpassing his original portrayer, the late Roger Delgado. Like the Master, Spurrier had given the SEC fits since he first took over as HC of Florida back in the day. The Sontarans kind of look like Bulldogs. So the analogy at least works there. Also, The Sontarans always seem not to get the recognition they deserve as Doctor Who villains, which describes Georgia to a fault. Like Texas A&M in the SEC, The Weeping Angels are the new kids on the block in the Doctor Who universe. That hasn't stopped them from becoming probably the best monsters to come out of the series since it was revived back in 2005. The Angels' seem to be immobile statues, but take your eye off of them for one second, and they move at incredible speeds. Not unlike Aggie quarterback Johnny Manziel. Too easy. The race of prehistoric reptilians (okay, more saurian. But who's counting?) who ruled the Earth before the coming of mankind are near-perfect analogs of The Gators. Well, maybe the Silurians' aquatic cousins, The Sea Devils, are more appropriate. But they looks more like turtles than gators. So I'm sticking with the Silurians. Okay, Sutekh only appeared once, but it was in the best Doctor Who serial ever made, "Pyramids of Mars," and there's no other Doctor villain I'd use to compare to LSU HC Les Miles than the Egyptian god of evil.